The State College Spikes announced their 2013 year-end award winners in a ceremony prior to Friday's regular season home finale against the Jamestown Jammers at Medlar Field at Lubrano Park. First baseman David Washington won the Spikes Most Valuable Player Award, while right-hander Nick Petree earned the Spikes Pitcher of the Year Award. 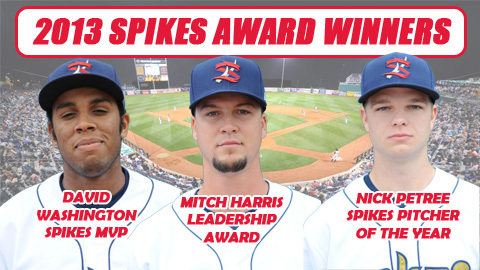 Right-handed pitcher Mitch Harris was named the Spikes Leadership Award winner, presented by the Spikes Booster Club. Washington broke single-season club records in home runs with ten and RBI with 48 this year. The San Diego native leads the New York-Penn League in runs batted in, and is hitting .263 on the season through August 29. Washington 36 walks and eight intentional walks also lead the league, and his 112 total bases are tied for second-most in the NYPL. The 6'5" big man earns the Spikes MVP award after playing against State College last year with the Batavia Muckdogs. The All-Star first baseman joins Major Leaguers Chase d'Arnaud (2008) and Brock Holt (2009) on the list of Spikes MVP winners, along with Justin Byler (2007), Adalberto Santos (2010), Wes Freeman (2011), and D.J. Crumlich (2012). Petree is third in the NYPL in earned run average with a 1.62 mark, and has allowed one run or less in 11 of his 12 appearances this year. The Missouri State product was chosen by the Cardinals in the ninth round of the 2013 MLB Draft, and has gone 3-1 on the season, with nine starts under his belt. Petree has struck out 46 batters, second most on the team, and walked 16 on the season. The right-hander joins Major Leaguers Tony Watson (2007) and Kyle McPherson (2009), as well as Alan Knotts (2008), Kevin Decker (2010), Nick Kingham (2011) and Clay Holmes (2012) as recipients of the Spikes' Pitcher of the Year award. Harris joined the Spikes after serving a five-year commitment in the United States Navy, and the 2008 13th-round draft choice of the Cardinals has been a stabilizing force in the bullpen. The righty is 3-1 with a 0.89 ERA in 18 appearances so far in his debut season as a professional, with 27 strikeouts to 14 walks over 30 1/3 innings. The 27-year-old Harris is also one of the NYPL's leaders in opponents' batting average, with his .183 mark good for fourth-best among the league's relievers. Previous Spikes Leadership Award winners include David Rubinstein (2009), Cole White (2010), Chase Lyles (2010), Matt Skirving (2011) and Jacob Stallings (2012). Information on all Spikes single-game, season and group ticket packages is available at State College Spikes.com. Fans can now purchase Four-Game Playoff Packs and individual playoff game tickets in anticipation of potential Spikes' home games during the 2013 NYPL playoffs. Four-Game Playoff Packs start as low as just $16 per seat and include a $2 per game savings off the single-game price. Plus, each seat purchased as part of a Four-Game Playoff Pack will come with a free, limited edition 2013 Spikes playoff t-shirt while supplies last. Four-Game Playoff Packs and individual playoff game tickets can also be purchased at the Spikes Box Office by calling (814) 272-1711 or by visiting in person. Fans can also reserve their Playoff Packs and individual playoff game tickets online at State College Spikes.com. Fans can follow the Spikes' push to the playoffs, as well as additional post-season ticket information, by heading to the Playoff Central page on State College Spikes.com.